Frosty, the ice cream snowman. Photo courtesy Breyers. This recipe was developed by Breyers, which used its chocolate chip ice cream. You can use coconut, egg nog, vanilla or any other ice cream flavor. 1. SCOOP the ice cream and quickly roll into 4 medium and 8 small ice cream balls. 2. ROLL the balls in coconut, reserve any remaining coconut. Arrange the balls on a a wax paper-lined baking pan. Cover and freeze 20 minutes or until ready to serve. 3. ASSEMBLE: Stack 1 medium and 2 small ice cream balls on each dessert plate. 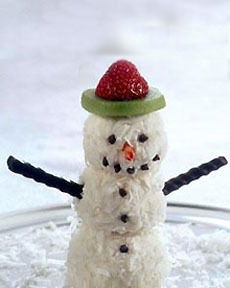 Insert a candy or wood stick down the center of the snowman to hold the three pieces together. 4. USE mini chocolate chips for the eyes, nose, mouth and buttons (alternatively, cut the nose from orange or red fruit leather). Add candy sticks arms. Top each snowman with kiwi and strawberry hats. Evenly sprinkle the plates with the remaining coconut “snow.” Serve immediately.